Mobile apps were once seen as a great way to engage customers – but consumers are falling out of love with the app experience. 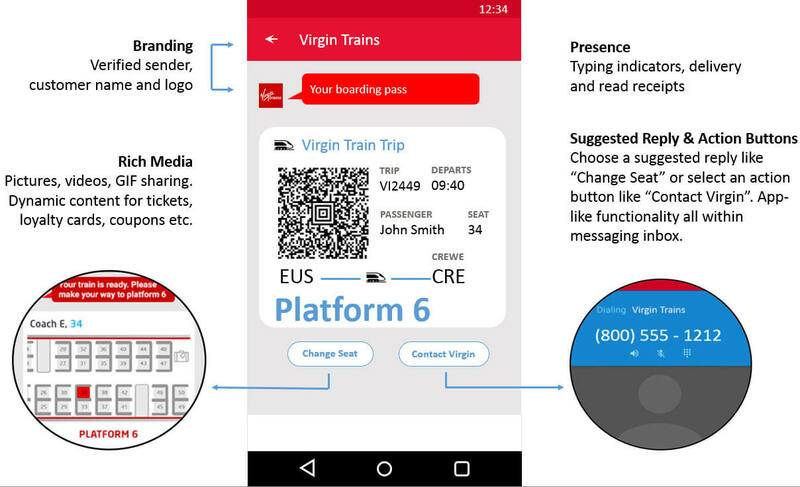 RCS promises an exciting, low-cost alternative that works for customers and brands. Imagine this: Phil’s meeting has over-run, and he’s going to miss the train he’s booked on. In the taxi, he frantically tries to download the train company’s app to find out when the next one is and rebook. But there’s no 4G signal, and the download just stalls. Result: he misses the next available train too – and doesn’t get home to see his kids before they’re asleep. It’s a familiar enough scenario, and one that highlights some of the limitations of apps as a customer engagement channel. The train company thought the app would help customers – but it’s just ended up causing frustration. Not long ago, mobile apps were considered the state of the art in customer engagement, and customers lapped them up. In 2016 alone, apps created over $44 million in revenue for their creators. But brands soon discovered that developing an app that’s fit for purpose requires significant investment. For a large brand, the cost can be as much as $1,000,000 – and that’s leading many to roll out poor apps with limited functionality. Faced with a deluge of substandard apps, consumers have stopped engaging with all but the best of them. Between 2015 and 2016, the top 15 app publishers saw a 20% drop in downloads, and consumers were using fewer apps overall. And the decline looks set to continue: Gartner predicts that one fifth of global brands will ditch their apps by 2019. That’s not to say that apps are dead – at least, not for a while yet. They’ll continue to be a secure way for customers to interact with brands; they enable access to vast amounts of data; and some deliver a genuinely valuable service – like online banking on the go. But with many apps, the customer experience just doesn’t match up with what people actually need. Most apps require users to email or pick up a phone if they need to speak to someone – making the experience much more clunky and frustrating than it needs to be. Plus, with apps, any new functionality requires a software update. This eats up time and budget and may stop it working altogether on some phones. So, is there a better way to get customers the information they need, just when they need it? As you might have guessed, there is. It’s called Rich Communication Services (RCS), and it promises to bring all of the benefits of an app to a widely-used communication channel that consumers genuinely appreciate: their text messaging inbox. Remember Phil? With RCS, his missed-train experience goes like this: When he first booked his train, he received an RCS confirmation to his text inbox. But unlike a traditional SMS, the message had a few extra features. Now, opening up the message in the taxi, Phil taps on a pre-set “missed train” button, which triggers a new RCS message with the time of the next train, the platform info, and a button to reserve a seat. In literally two taps, Phil fixes his own problem, receives confirmation that he’s now booked on the 18.05, and gets home in time to read his kids a story. Only the channel has changed – from app to RCS – but it’s improved Phil’s day immensely. With RCS, you can give customers the information they need, right when they need it to their text inbox – which is usually read within seconds. Messages sent just when the customer most needs them are what we at OpenMarket call “empathetic interactions”. By anticipating what your customers will value at any given moment, and delivering it as an easy-to-use message in a familiar channel, you’ll go a long way to earning lasting loyalty and advocacy. And the beauty of RCS isn’t just down to timely delivery and pre-set reply buttons. RCS lets you embed a huge variety of useful features in your messages – things like two-way text and picture messaging, verified sender logos, QR codes, calendar integration, maps, and voice messages. Another brand exploring the customer-experience potential of RCS is FICO. It’s pioneering the use of RCS messaging to alert banking and financial services customers to possible fraudulent activity on their account. By sending an RCS with details of the suspect transaction, and enabling the customer to confirm that the transaction is valid with a single tap, FICO has removed one of the huge customer pain points around fraud protection. Because the message is sent immediately after the transaction – and because 90% of all SMS messages are read within three minutes – banks and financial service providers can quickly authenticate customers’ identities. They can also avoid the #customerservicefail of putting a stop on the customer’s account and requiring them to call their bank (and wait in a queue) to sort it out. That simplicity shouldn’t be underestimated: in a recent OpenMarket survey, 60% of consumers said convenience is the thing they like best about RCS. The slick, app-like look-and-feel of an RCS message is another bonus. According to OpenMarket research, 79% of consumers feel safer interacting with businesses that have verified company branding on texts and sender IDs – which is much easier to do with RCS than with SMS. So not only does RCS offer a smoother experience than an app, customers feel just as safe using it, too. RCS is poised to break through, and due to support from global mobile providers and handset manufacturers, hopefully it will soon be available to everyone with a smartphone. By exploring its potential now, you can start to give your customers the experiences they crave – and get ahead of competitors who are still relying on apps as an engagement channel. Ready to press the button? To find out more about RCS, who’s using it, and how you can start exploring its potential, get our RCS datasheet or sign up for our RCS Early Access Program. And if you’d like to talk to someone today about adding RCS to your customer engagement platforms, give us a call. We’re really excited to help you make the most of the opportunity.